Even though cheesecake is a popular dessert, sometimes you want to scale it down. The solution? Baking Cheesecake For Two in Ramekins! This plain mini cheesecake recipe makes enough dessert for two and can be customized with different toppings and batters. 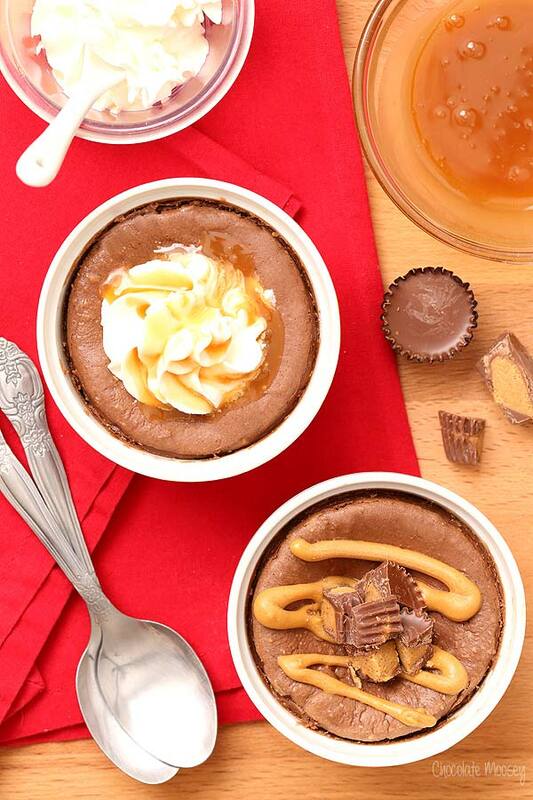 Mini chocolate cheesecake recipe for two also included. Cheesecake – It’s one of my favorite desserts to eat. Probably because it’s not something I eat all the time. It’s also one of those polarizing desserts – you either love it or hate it. I haven’t really found anyone who is neutral about it. And naturally I found a way to scale the recipe down. The reason I post recipes for two people is because I hate dealing with leftovers and throwing away food. 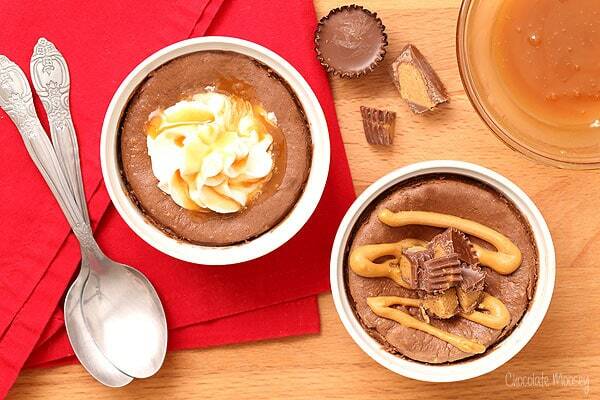 But a lot of you have told me you do it for portion control, especially when it comes to dessert. I agree with you. As much as I love cheesecake, I can’t always go making a whole one. Sometimes I want one slice and am done (not because I don’t want the rest of the cheesecake but rather I know what the consequences would be). My solution? Scaling it down and making Baked Cheesecake For Two in Ramekins. You can totally customize this easy cheesecake recipe for two for each person with different toppings (or all for yourself – nobody’s looking). Make it plain or make it chocolate. Make it with a graham cracker crust or make it crustless. The flavors really are endless! I have a friend who sent me an “angry” text one day, asking why didn’t I have just a plain cheesecake recipe on my site? I told her I had the perfect recipe but never posted it as is; it always had to have a little pizzazz. Since then I have posted my Classic Cheesecake recipe, but I told her she can make my mini version of it (and then share it with me because I’m a good friend. Ahem). I scaled down my favorite cheesecake recipe, baked in ramekins, then had some fun with the toppings. Top it with sliced strawberries or homemade strawberry sauce. Top it with homemade whipped cream and a cherry on top. Top it with homemade caramel sauce. Top it with melted peanut butter chips or chopped peanut butter cups. Make them plain. Make them chocolate. Make one plain and one chocolate. I know you’re smart and will come up with even better flavors than that. Just let your heart (and your taste buds) guide you. 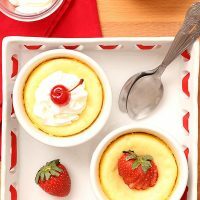 I used two 6 ounce ramekins for this easy cheesecake for two recipe. 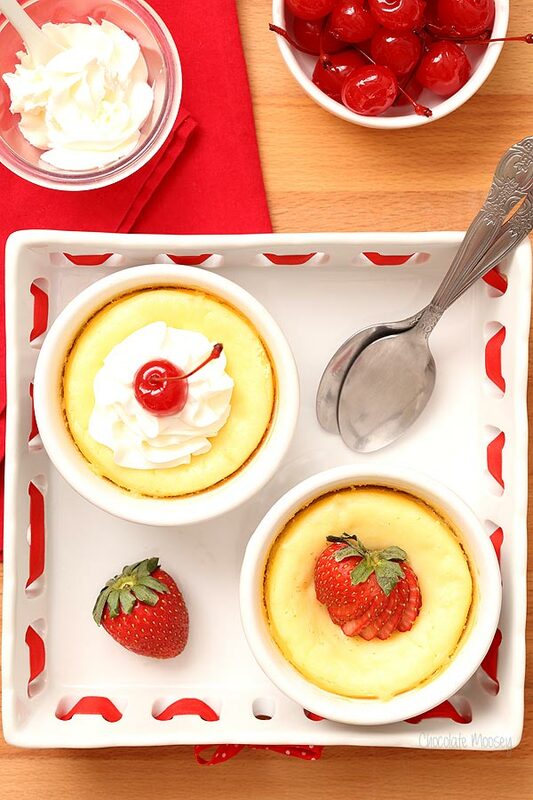 Since ramekins can vary in size, it is possible the cheesecake may sink in the middle. This is due to the ramekin being too small, so it rises too high then sinks as it cools. If this happens, just add extra whipped cream on top. Problem solved. Because this cheesecake recipe is scaled down for two ramekins, it uses an egg yolk instead of a whole egg. Make sure you check out my recipes for using leftover egg whites. One question I get a lot is whether you need a water bath for cheesecake. The answer is no! This recipe makes the perfect cheesecake without a water bath. I can’t speak for other recipes on the internet, but I’ve tested my cheesecake recipe a lot without a water bath. There is no cracking on top, as long as you don’t overbake it. If you do end up with a pesky crack, cover it up with whipped cream. Nobody will notice. The hardest part about baking for two is sometimes you don’t use the full ingredient amount. Take cream cheese, for example. It only comes in 8 ounce blocks, but this recipe uses 5 ounces. What do you do with the rest? Make a small batch of Eggless Cheesecake Cookies. This plain mini cheesecake recipe baked in ramekins makes enough dessert for two and can be customized with different toppings and batters. Mini chocolate cheesecake recipe for two also included. Preheat oven to 350F. 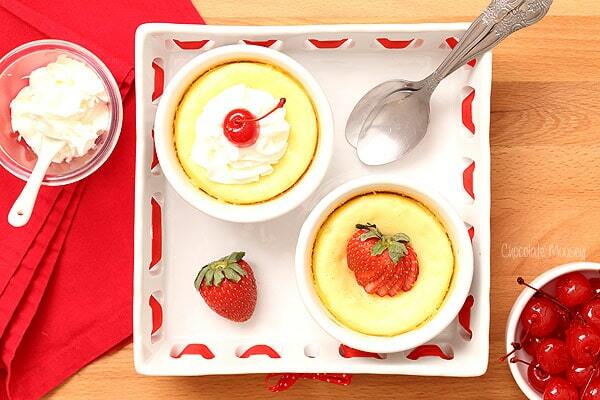 Have two 6-ounce ramekins* ready and place on a baking sheet. In a small bowl, mix together the crumbs and melted butter. Press into the bottom of each ramekin. In a large mixing bowl, beat together the cream cheese and sugar until smooth and creamy, about 1-2 minutes. Scrape down the bowl then beat in the egg yolk until incorporated, about 1 minute. Beat in the vanilla and melted chocolate if using. Divide the batter between the ramekins and bake for 18-20 minutes or until the tops are firm to the touch. There may be a slight jiggle when moved - that's ok. Cool completely then refrigerate at least 4 hours or overnight. Serve with various toppings. 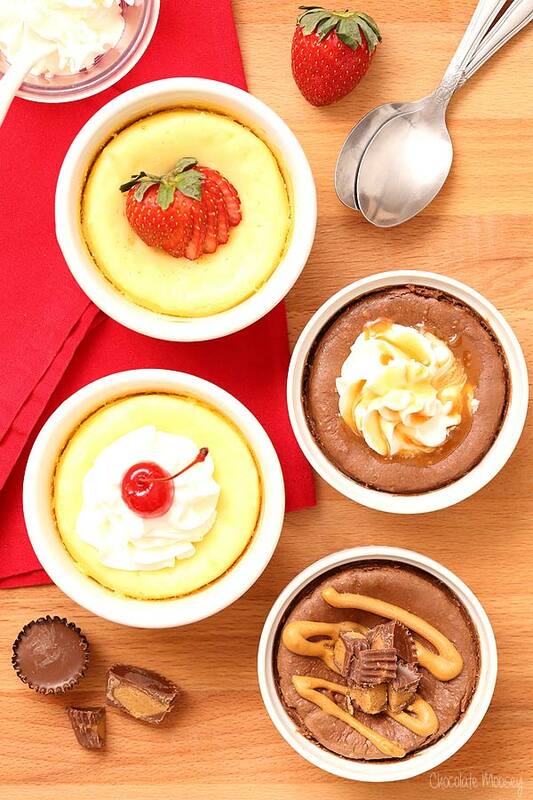 Because ramekins can vary in size, it is possible the cheesecake may sink in the middle due to small ramekin size. If this happens, add extra toppings. 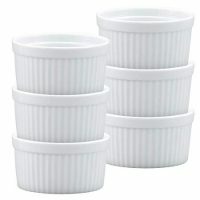 If you use 4 ounce ramekins, you may need to divide the batter among three ramekins to avoid overflow. Disclosure: This post contains Amazon affiliate links, which means I earn a small amount of money if you buy through these links. All money goes back into running this blog (mainly groceries). Thank you for your support! It’s the perfect dessert for a couple but to be honest my husband would probably devour both in one sitting. Mmm I love raspberries and chocolate together. Good pick! Cheesecake for two? I’m seeing cheesecake for ME… one for right away and one to hide in the cheese drawer of the fridge for later! Hehehe. This looks so good! How fun are these pictures! These cheesecakes look amazing! Can’t decide if I like the chocolate or plain cheesecake more! Think I will have to make both recipes.. I just love how they are single serving portions! Hey there. Long time fan, first time writer. 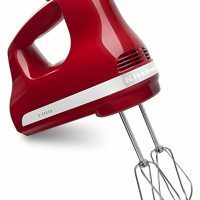 My beloved and I have made your cheesecake a hand full of times. He is among the poor souls who cannot have cow dairy. We’ve found chevre goat cheese works well in this recipe as a substitution in place of the cream cheese :D.
Oh good to know goat cheese works as an easy sub for dairy! Another great recipe for a small proportion. Thanks, Karina! I hope you find my recipes helpful for cutting down on portion sizes. Please let me know how the cheesecakes turn out! awesome to eat and easy to make! This was wonderful! We used almond extract instead of vanilla and it was heavenly, though I had to give it nearly 20 more minutes in the oven, but that was probably our ovens fault. Wonderful recipe! Glad you enjoyed them! Love the almond extract sub (isn’t it a great flavor?!). I highly recommending investing in an oven thermometer to double check the temperature before baking. That should help make the bake time more accurate. These were perfect! First time ever making cheesecake and they were delicious, I didn’t have enough cream cheese so I added a about two teaspoons of heavy whipping cream after adding the vanilla & placed the cheesecakes in a deep dish filled almost two inches with water & baked following the same instructions and it was amazing !!!!! Came out perfect! Glad you were able to make it work! The water bath is certainly not needed (for anyone reading the comments thinking you need one), but I guess it doesn’t hurt either.